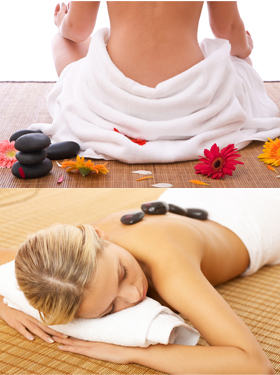 Hot Stones therapy is a modern approach to alternating temperatures in massage with the use of hot and cold stones. The physiological benefits of alternating hot and cold to the body have long been scientifically and medically proven. It has the added plus of benefiting both client and therapist at once. The "vascular gymnastics" of the circulatory system assists the body in self healing. The powerful energies of the stones are known to promote a harmonizing and cleansing effect, allowing a meditative state as in calming and peaceful. The temperature of the stone is transferred to the body by means of conduction. The longer the application, the deeper the penetration is. Penetration can reach into the superficial layer of the muscle worked on. An increase in cell metabolism increases blood and lymph flow, which helps to remove toxins from the tissue. It is believed that when you increase the blood flow through the skin, liver, bowels and kidneys, detoxification increases. This therapy is unique in that it combines the stones warm thermal condition which brings about local and systematic changes in the body and also influences the energy centres of the body and mind balancing. The application of hands together with the stones produces intensified contact with the unique energies of the stones and with the universal energy assisting the energy flow within, directs the energy flow to blocked areas. It increases heart rate and respiration. An adequate local application of warm and cold stones to the skin surface not only affects the immediate skin area, but also other areas in the body via the nervous system. The skin surface carries the stimulus along a nerve fibre to the spinal cord and from there the stimulus can travel to a related organ. The systemic affect of cold increase the general metabolism while the systemic effect of warm is sedative.